Where's A Bad Place To Walk Your Dog? Right in the middle of a dang bike race! 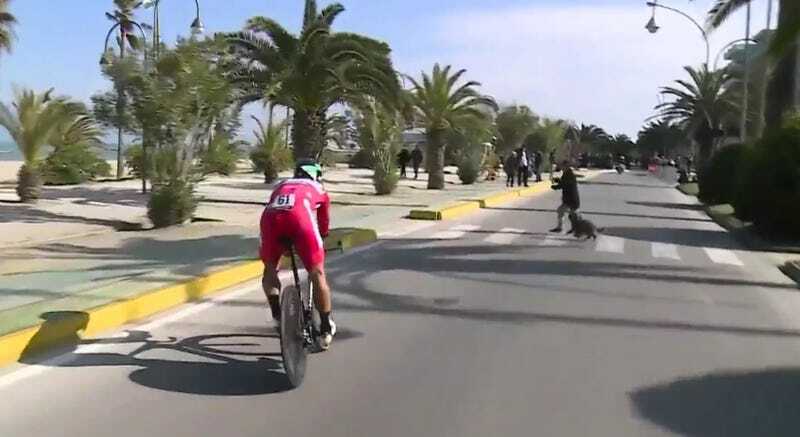 Luckily, Bora’s Peter Sagan is maybe the best bike handler in the business, so he had no problem dodging this dog. An action photo shows that the pup in question is probably a water spaniel or, less likely, a small labradoodle. As far as I can tell, neither breed is capable of riding a bike, so they should stay out of races. Leave the racing to the champion athlete dogs.